Retire to Uruguay...the Europe of South America The Plaza of Independence in Montevideo, the capital of Uruguay. Retire to Uruguay...why are more and more folks retiring to Uruguay? A country of only 3.3 million people is becoming a retirement haven for those in the know. Among it's attributes are low corruption; 98% literacy rate ;very good, inexpensive healthcare;a modern infrastructure; low crime rate; and a high standard of living for little money. If you enjoy visiting Europe, for the great cuisine and culture that you might find in Paris... But do not want to pay Parisienne prices, take a good look at Uruguay. 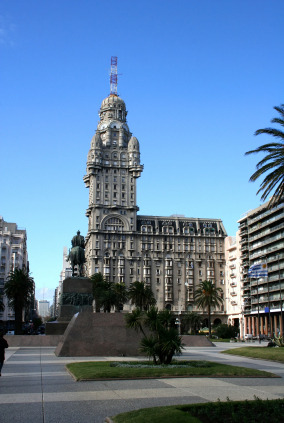 You will find that Montevideo will remind you very much of any of the major cities in Europe. Retirement in Uruguay is still under the radar...it may not be such a secret much longer. Here is a great resource on Uruguay living. If anyone is contemplating moving to a foreign land read everything you can before you go. Why is Uruguay so attractive? Uruguay offers a varied lifestyle, from modern cities to the beaches of Punta Del Este...the Nice of South America. $1,000 to $2500 a month will have you living a very nice lifestyle. It is comparable in cost to Mexico, although much more sophisticated. This figure includes private health insurance that costs anywhere from $40 to $100 a month. What is hard to put a price on is the fact that Uruguay is a small country without big city worries, no wars, no demonstrations, rather a pace of life that make retiring to Uruguay very attractive. Return from retire to Uruguay to retire overseas.